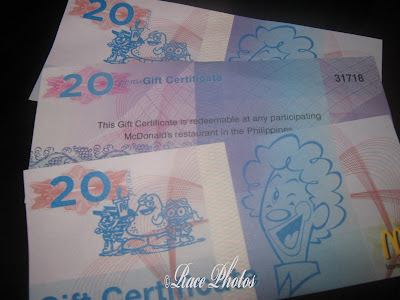 These are 20-peso gift certificates worth of McDonalds goods given to my three kids as freebies. The kids love it even if it's not enough to buy their favorite food in McDonalds. They just love having these gift certificates and they will just add some money if the price of their purchase is higher. For more photo hunt 'Three' entries just click on the badge above. I love freebies! am sure, your kids were excited to have them. Happy weekend! This has been such a fun theme with so many different angles. You've got a great shot that fits the theme just right. meron palang ganito? ok na ok sa mga kids yan. Congrats on those GCs! My daughther loves McDo too, altough she is afraid of Grimace.